How can this be? 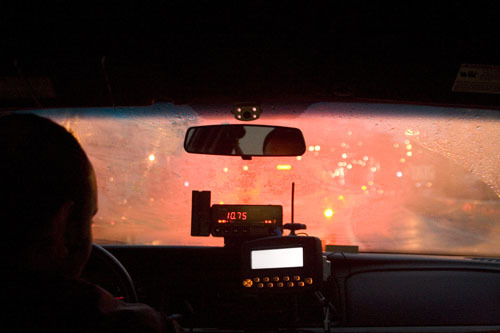 In 2007, several City Hall insiders look-ed at the cab industry and saw Opportunity. Inside a 30-page transportation bill, they hid three sentences (abolish the Taxi Commission, place the cab industry under MTA control) and in that off-year election snuck the whole thing past the voters – with Yes votes from just 15% of the electorate. Since officially absorbing the cab industry in 2009, the MTA has siphoned off some $33 million generated strictly by the labor of San Francisco cab drivers and has used it, mainly, to fund paychecks and benefits for the 5,000 Haves. In February the MTA announced a plan to take even more –roughly $20 million per year – from the cab industry: roughly $4,000 per driver! And now they’re trying to ram this new outrage down the cab industry’s throat. I’m 60 years old. Since I started cab driving (in 1985) I have been disrespected, and have seen my brother and sister cab drivers disrespected, thousands of times. From 1993-95 I put every ounce of myself into making UTW strong. In 1994 we had 400 dues-paying members. We raised $25,000 and filed a lawsuit against the City. I still recall the tone of the ruling: Question the system? Idiot cab drivers – Screw you! Activists burn out. I burned out for years. I’ve seen other cab industry leaders burn out, put their heads down, and go back to driving and minding their own business. Sometimes they come back for awhile, sometimes not. I may have one good fight left in me. But I’m not here just to win a battle over medallions or to get some piddly leaflet permit from SFO. I’m in this to finally establish what was missing when I started driving, in 1985: Dignity for cab drivers. Dignity comes from strength. And without proving our strength, without getting organized, we will always lose. The MTA’s taxi deputy, Christiane Hayashi, makes $140,000/yr plus benefits. MTA Director Ed Reiskin makes $294,000. I’m guessing Malcolm Heinicke, the MTA Board member who publicly proposed stripping all medallions from cab drivers, earns millions per year from his law firm. They will fight for every penny they can take from cab drivers. And if they retire, the MTA will hire someone else to do the same job. But these people running, and ruining, our cab driving lives total just a few dozen. There are thousands of us – 7,000 A-card holders, including 5,000 ‘active drivers’ (MTA figures). If just 2,000 of us step up with a mere $20/month, we would have a budget of $480,000 per year, and a completely transformed industry. Can you imagine what you and Mark Gruberg and Tariq Mehmood and Saam Aryan could do with half a million bucks per year? We could get up off our knees. The MTA would not be cannibalizing our industry. Candidates wanting to be elected to the Board of Supervisors would request our advice and support. This industry is ours for the taking. The Stop the MTA committee is preparing a plan. Stand by. When it’s time to donate, read it here. Things are about to get interesting. “I started driving in 1990 and this happened in 2004, when I was 44 years old. It was Friday night, late, almost the end of my shift. I picked up four people at Sutter and Mason and dropped three of them on Potrero Hill. The last guy needed to go out to Hunters Point. This was when they were still putting in the Muni line out there, and there were lots of those big orange construction barriers, the kind you fill with water, in the middle of the Third Street median. Go out and shoot someone and you’re in. I see the flash of light from the revolver and I say to my passenger, "He’s shooting at us!" The first bullet lodged in the dashboard. If he’d aimed a little higher I might not be talking to you now. I see his aim, so I lean forward and kind of hug the steering wheel and manage to dodge the second bullet – it goes in the driver side window and out the passenger window. The doctors said I’d be better off if they didn’t operate, so the bullet’s still in there. A little lead souvenir. I feel it every day, like someone pressing their index finger on my upper back, a couple of inches in from my armpit. Also I’ve got some tingling down my left arm – nerve damage. On the way to the hospital I called my manager and told him I’d been shot. He came straight to the hospital, and when I saw him I said, “That’s it! That’s my last shift for this year.” And I took the rest of the year off. Fortunately I’d recently gotten my medallion, so I could afford to recuperate – just barely. I came back the next January, and have been driving ever since. What if I’d been a Muni driver? Oh, that’s a great question. Man, I can hardly imagine what all would have been available to me. Obviously workers comp, and lots of other support. 50 people rules 5,000 drivers! About the I have been shot. I am sorry to hear about your disturbing experience. I would be curious to find out if the police follow through with the investigation and if anything gets done. If you would call me at 415-240-2433. Something needs to be done by the police to try and stop these shootings at cabbies. Did the police actually look at the video and try to see who the shooter is or just say stupid cab driver? Unfortunately I was shot at in 2007 and luckily missed. There was no follow up from the police though they came to the scene and investigated. When fellow cab drivers heard about the situation, I was made fun of me because of the incident. The police found seven rounds that were spent from a 45. At the time I was working for National Cab Company and when I dispatched in emergency, I got no response from the dispatcher Frank. I did about 30 minutes got a call from the 911 operator, because someone who witnessed called in for me and told my cab number. Cab drivers do need to come together Brad. I have always respected your writings but it is hard to show respect for those who laugh at someone in the industry for being shot at while working or are simply being harassed. How are cabbies suppose to come together when there is always something more important than a situation such as a shooting? Cabbies need to stop attacking cabbies and yes Brad, come together to fight the MTA but also other working conditions. Additionally, The contents are masterpiece. you have completed a spectacular exercise on this matter! All forms of taxation are unfair. But hey, that's just like, my opinion, man.